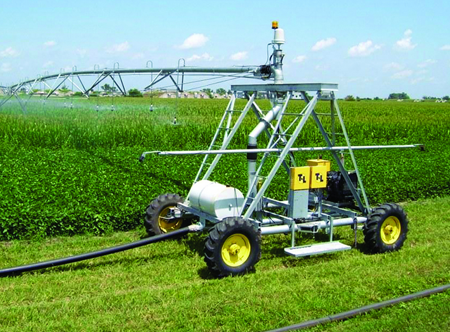 T-L’s “ULTRA Linear Tractor” allows you to irrigate adjacent parallel fields with one system. The spans linear pivot around a stationary 4-wheel tractor using a furrow, cable, concrete ditch or buried wire for guidance. The tractor can rotate allowing the system to operate in a variety of orientations such as a linear pivot. Maximize irrigated acres using one machine. Can operate as either a linear pivot or just as a pivot. Reduce labor costs up to 90% compared to traditional irrigation methods such as gated pipe. Continuous movement results in very high distribution uniformity. Low Voltage DC power eliminates the risks associated with high voltage AC power. Proprietary Hydro-Clear® Hydraulic Pivot Oil formulation is environmentally friendly. Continuous movement achieved through the Hydrostatic Drive vs. start-stop action of high voltage AC machines. 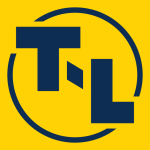 Only system in the industry to utilize real-time speed feedback for accurate speed control. Speed Sensors in the hydraulic motors at each end tower. User friendly Precision Linear Control Panel. Real-time diagnostic information at user’s fingertips. Automatic application changes can be programmed at different locations in the field, reducing the number of trips made. Versatile tractor platform can be adapted to several water feed and guidance options.